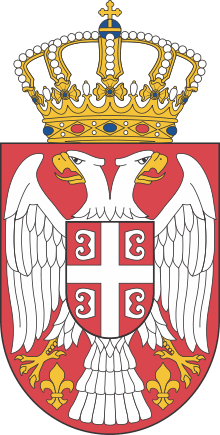 The Government of Serbia (Serbian: Влада Србије / Vlada Srbije), formally the Government of the Republic of Serbia (Serbian: Влада Републике Србије / Vlada Republike Srbije), commonly abbreviated to Serbian Government (Serbian: Српска Влада / Srpska Vlada), is the executive branch of government in Serbia. The affairs of government are decided by a Cabinet of Ministers, which is led by the Prime Minister. The incumbent Cabinet was elected on 11 August 2016. The incumbent Cabinet was elected on 11 August 2016 by a majority vote in the National Assembly. 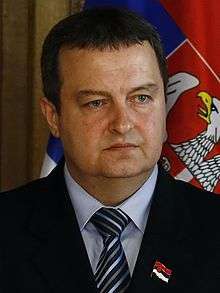 It is the second consecutive cabinet presided by Aleksandar Vučić. It has 19 members, 16 with a ministry and 3 without portfolio. 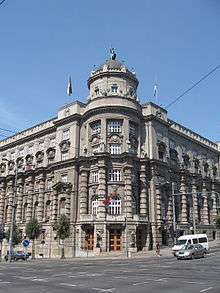 Office for Regulatory Reform and Regulatory Impact Assessments (director: Mira Prokopijević). 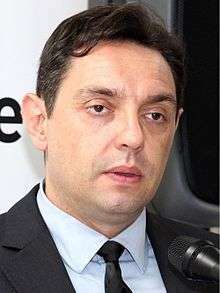 ↑ "Serbia gets new government, ministers take oath of office". 11 August 2016. Retrieved 12 August 2016. ↑ "Srbija rekorder u broju agencija" (in Serbian). 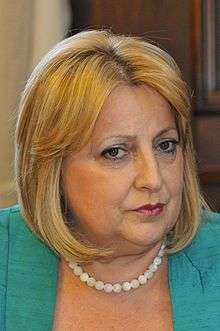 B92. 17 December 2011. ↑ "Republičke agencije, zavodi i druge organizacije" (in Serbian). ↑ "Serbian government" (in Serbian).